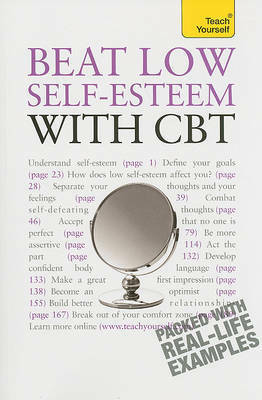 Improve your self-esteem by mastering the principles of CBT Using the proven techniques of cognitive behavioral therapy, this book will help you understand the impact that poor self-esteem could be having on your life and give you the tools you need to turn self-criticism into self-acceptance. It will help you tackle and change the negative beliefs that cause you anxiety and pain. You will become fundamentally more confident, content and at ease with yourself. You can also visit teachyourself.com for tests, extension articles and a vibrant community of like-minded learners. And if you don't have much time, don't worry--this book gives you one-, five-, and 10-minute bites of learning to get you started. Christine Wilding holds a post-graduate diploma in cognitive behavioural therapy from the University of London and is a practising CBT therapist at the Cygnet Hospital, Sevenoaks, Kent, as well as in private and corporate practice. Christine is also a chartered human resource practitioner specialising in workplace stress management and inter-personal skills training. Stephen Palmer is founder director of the Centre for Stress Management, honorary professor of psychology at City University, coaching trainer and consultant, and editor of numerous journals.